Having left South Wales for last week’s post, this week I am back in England and on the road to Stratford-upon-Avon. Not using the M40 which was many years in the future when my father took these photos, rather following the lanes that threaded through Berkshire, Oxfordshire and Warwickshire. I can track the route he took as I have many of the Ordnance Survey maps that he used and marked with the routes taken, although there is one map missing for this journey. 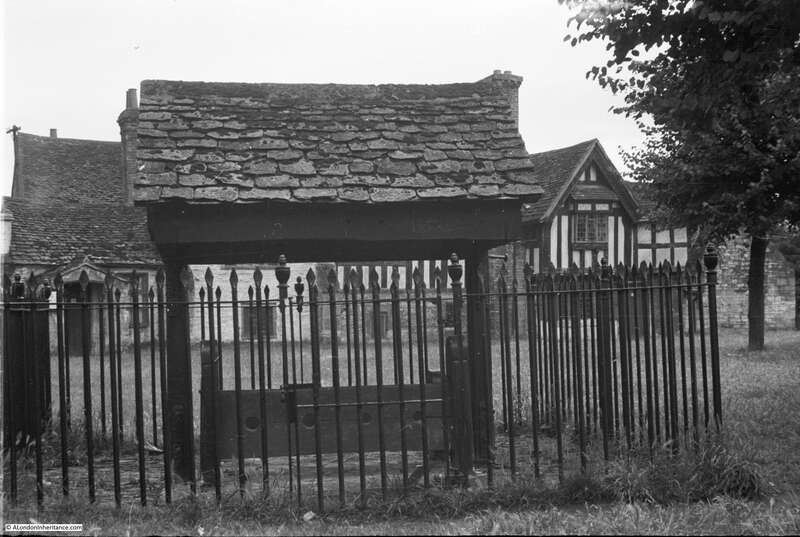 Cycling out from London, along the A4 through Slough and Maidenhead, then taking the lanes to Henley-on-Thames and through Watlington to reach the first photo of a monument at Chalgrove in Oxfordshire. This is the monument to John Hampden, probably born in London in 1595, he became one of the Parliamentarians who resisted Charles I’s demands for payment of the Ship Money Tax in 1635 and later demanded that the King handover control of the Tower of London to Parliament. He fought on the side of Parliament during the English Civil War having raised a regiment from his tenants in Buckinghamshire and Oxfordshire. 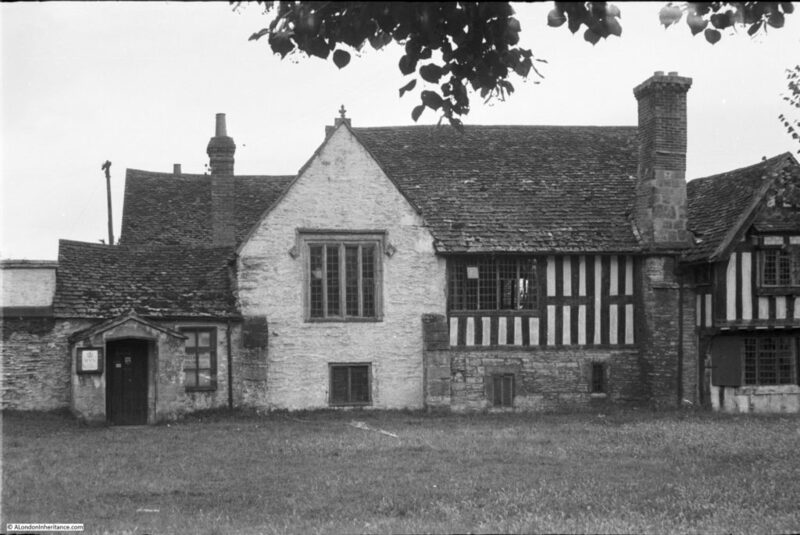 In June 1643, the Royalist and Parliamentary forces faced each other across the Oxfordshire countryside with the Royalists based in Oxford and the headquarters of the Parliamentarians in Thame. Prince Rupert, the nephew of Charles I, had word that a pay wagon was travelling to Thame and saw an opportunity to inflict damage on the Parliamentary forces. He left Oxford on the 17th June 1643 with a force of 2,000. Skirmishes with small Parliamentarian outposts at Tetsworth and Postcombe were followed by a victory at Chinnor where 50 Parliamentarian soldiers were killed and 120 captured. The rumored pay wagon had heard the fighting and headed away from the town. The Parliamentary army was gathering to the south and met the Royalist forces at Chalgrove in the fields surrounding the monument. John Hampden was shot and seriously wounded not far from where the monument now stands and was taken back to Thame where he died of his wounds on the 24th June. The Royalists achieved a significant victory at Chalgrove and Prince Rupert returned to Oxford. 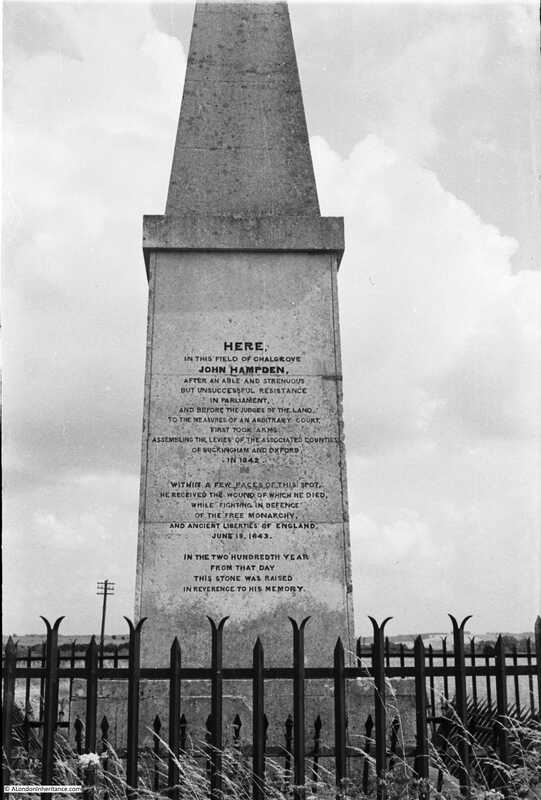 The monument was unveiled on the 18th June 1843, two hundred years after the battle. Paid for by subscription, the names of the subscribers are recorded on the monument along with an effigy of John Hampden and his coat of arms. I found the monument late one evening when it was getting dark. There is some light industry in the area now, however at this time in the evening it was quiet, and looking over the fields on a summer’s evening it is hard to imagine the fighting that took place here on a summer’s day in 1643. 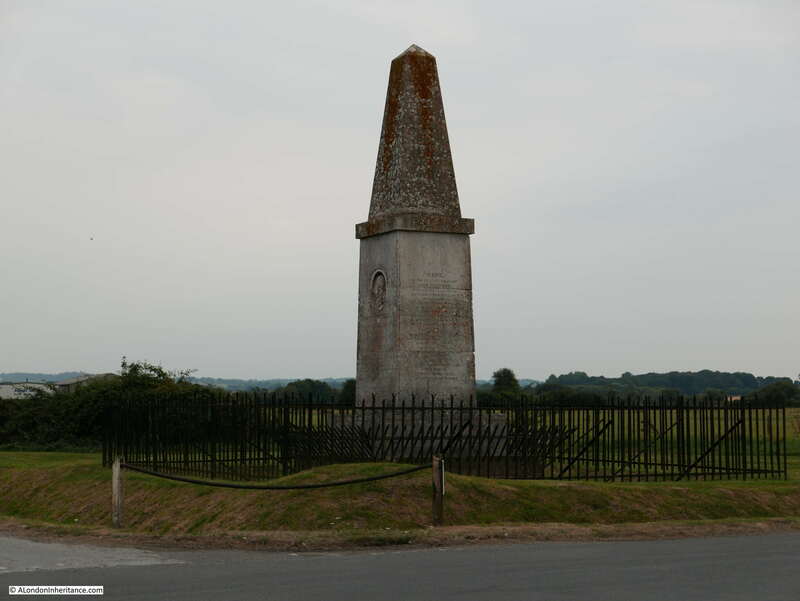 The monument is well-preserved in the centre of a road junction and is surrounded by iron railings and a large ditch. Leaving Chalgrove, the route then disappears onto Ordnance Survey map 158 which I do not have, before returning onto map 145 covering the area around Banbury, where we leave Banbury on the A422 to head to Stratford-upon-Avon. 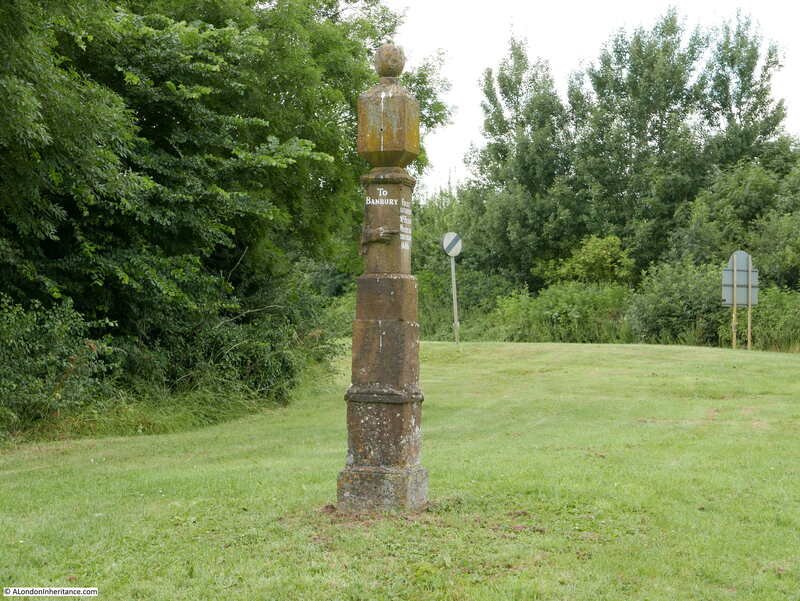 Passing through the village of Wroxton, we find the Wroxton Guide Post at the side of the road. The Guide Post dates from 1686 and is a marker on one of the routes from Wales and the west to London. Allegedly used by salt merchants, the route follows the A422 down to Wroxton where is breaks from the road and heads to the south of Banbury. The 1946 edition of the Ordnance Survey one inch map for the area shows the Salt Way marked. The top of the guide post was originally a sundial and around the middle of the post are carved hands pointing to the towns along the adjacent roads. 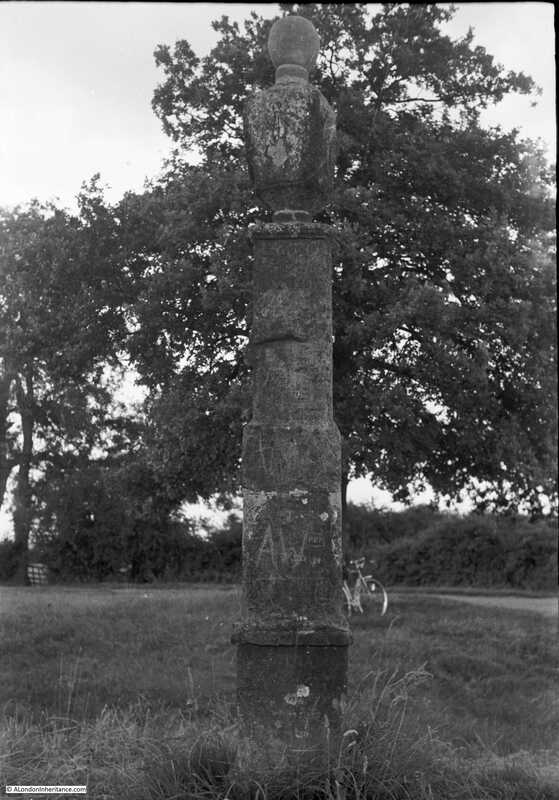 If you look at my father’s photo you can see that the guide post was in need of some repair with initials being carved on the stone as well as general deterioration. The guide post was restored in 1974 and still looks in good condition with the directions and carved hands clearly visible. Directions are given on three sides of the post. I do like the two hands pointing to London and Stratford-upon-Avon (thereby just maintaining a tenuous connection with London for this week’s post). The fourth side records the name of Mr Francis White who, although very little is known about him, was responsible in some way for the funding or provision of the guide post. 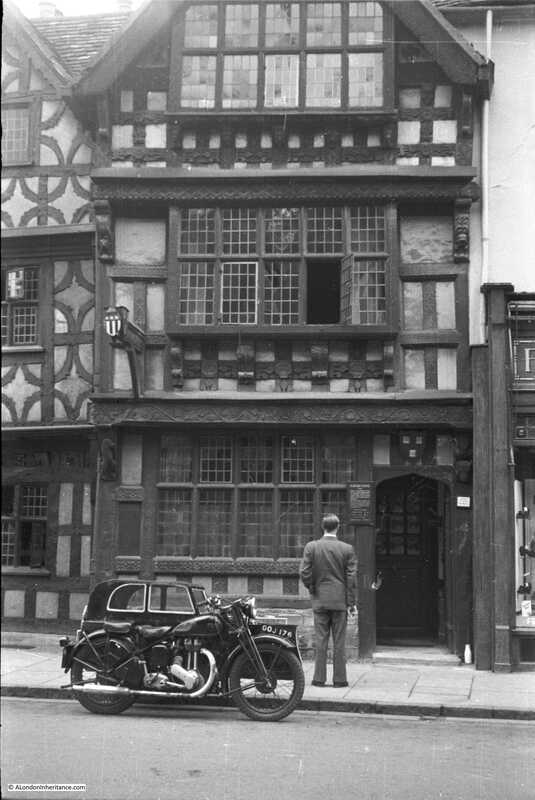 Photo of part of the 1946 edition of the Ordnance Survey one-inch map, the Banbury edition, number 145. Banbury is the edge of the town seen in the lower right edge with Wroxton just to the left on the A422. 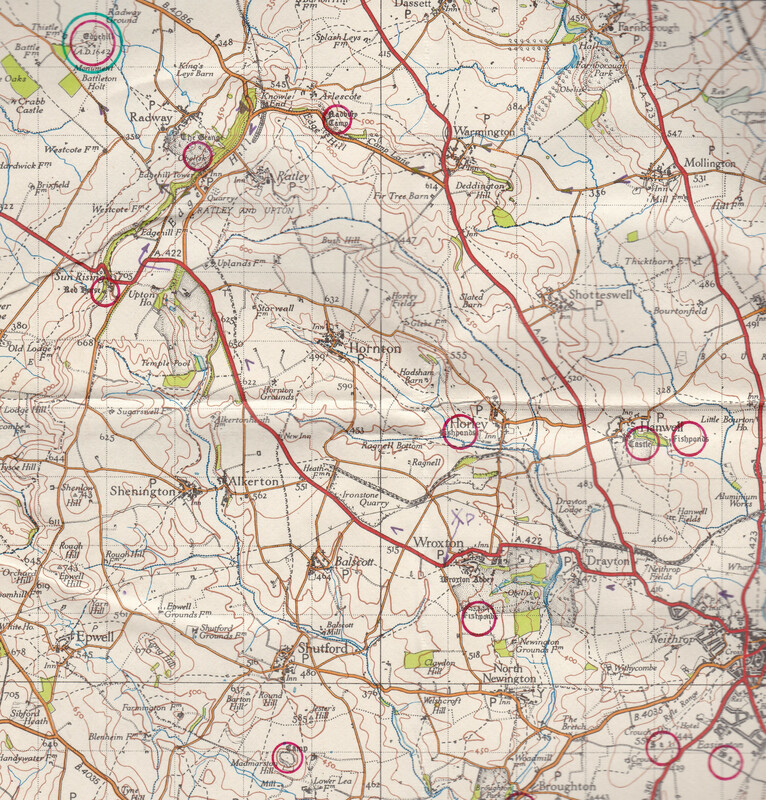 The Salt Way is as the very bottom right corner, my father drew two red circles around this and there is a note of XP in purple ink pointing to the Guide Post just to the left of Wroxton. There are also purple arrows showing the route he and his friends cycled on the way to Stratford-upon-Avon. The A422 is the road that runs from Banbury at lower right up towards the left. If you follow the A422 away from Wroxton, there is a sharp turn to the left, followed by a sharp turn to the right then passing a place called Sun Rising. This is Edge Hill where the height drops dramatically, I can imagine the name is due to the view of the light across the land as the sun rises as the view from here is impressive. 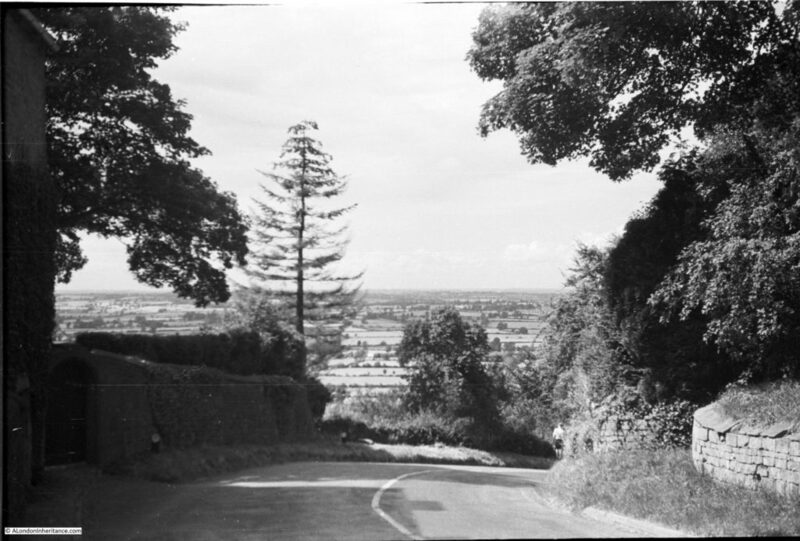 My father took the following photo from the point at the top of the hill where the road is just about to turn to the right and the view is of flat land stretching away towards the north-west and towards Stratford-upon-Avon. Although the road today follows exactly the same route, I did not stop to take a comparison photo. There are no paths or walkways along the edge of the road which is up against the walls on either side. The road is also very busy and standing on the road at a bend was not the wisest thing to do. Also, trees have now grown which sadly completely obscures the view. 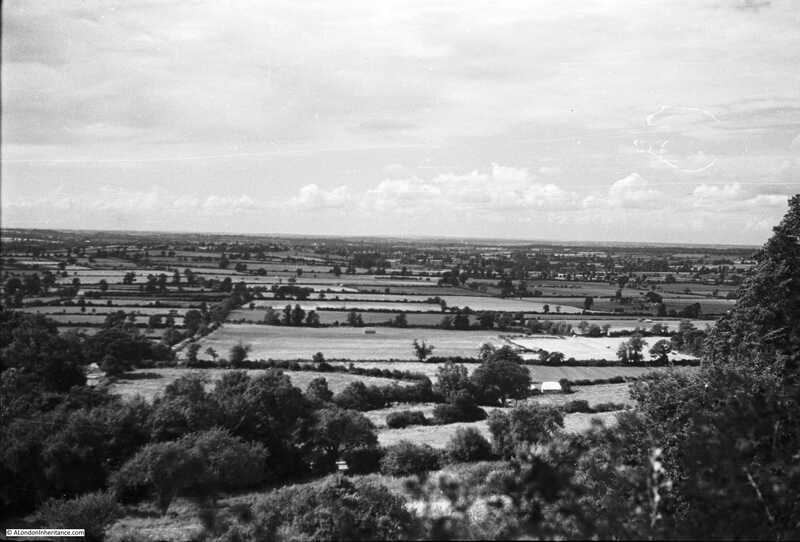 Another view from the top of Edge Hill on a summers day in 1949. Edge Hill has also given its name to another battle from the Civil War. This was the first skirmish between the Royalist and Parliamentarian forces and took place on the 23rd October 1642. The Royalist forces was based at Edge Hill with the Parliamentarian forces on the plain below. The Royalists attacked from Edge Hill and the battle took place across the land in the above photo. If you look back at the extract from the Ordnance Survey map, the marker for the battle on the map is ringed in blue and red circles. Much of the land where the battle took place is today owned by the Ministry of Defence and so is not easy to visit. Leaving Edge Hill, the A422 runs directly to Stratford-upon-Avon. Known around the world as the birthplace of William Shakespeare, Stratford-upon-Avon is now a major tourist destination with 4.9 million visitors each year and generating £28 million for the local economy each month, and being in Stratford-upon-Avon on a summer’s weekend it is easy to see how. 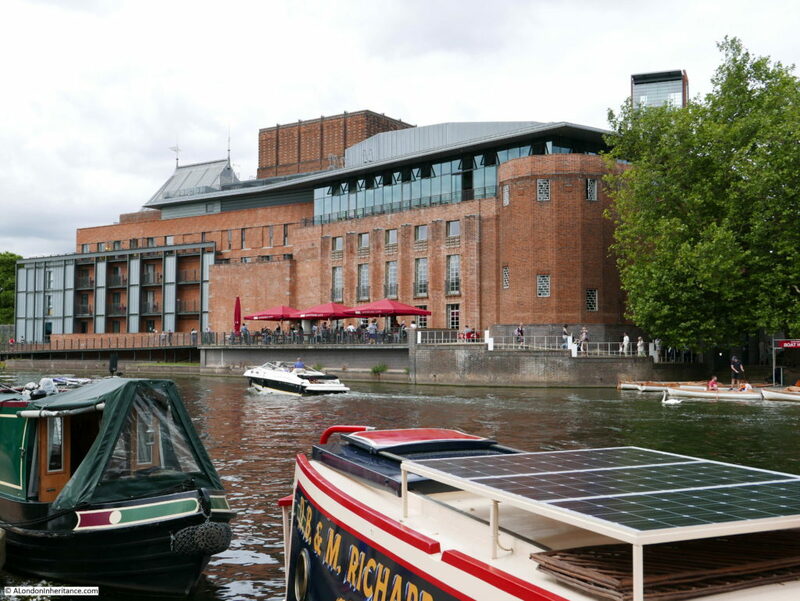 Stratford-upon-Avon is also the home to the Royal Shakespeare Company, with the Royal Shakespeare Theatre being a major landmark alongside the River Avon. 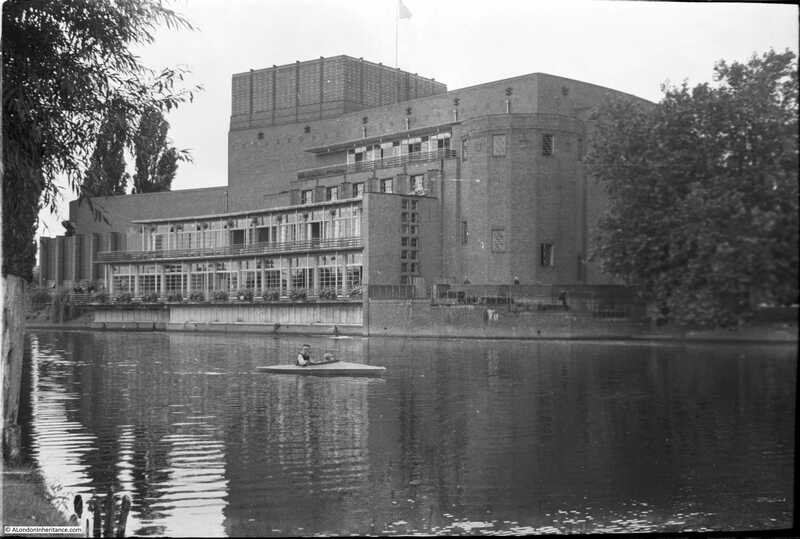 Two of my father’s photos showing the theatre with a couple of small boats passing on the Avon. The view from roughly the same position today. 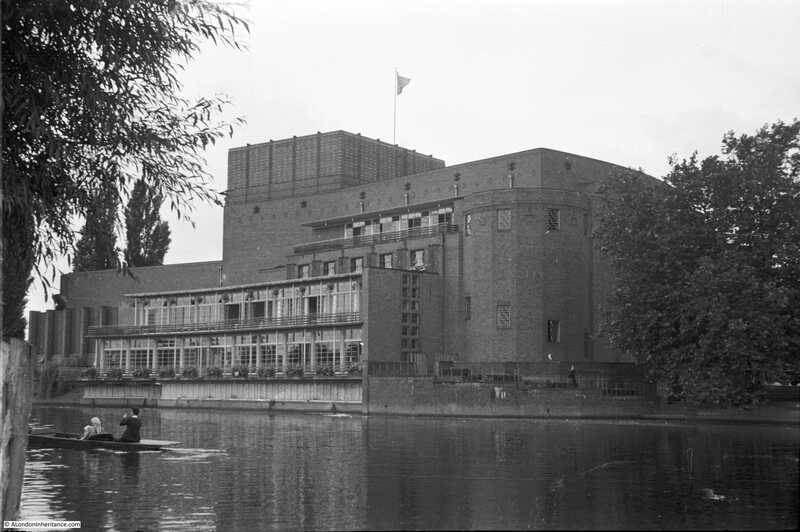 The theatre went through a major rebuild between 2007 and 2010 which accounts for the changes to the theatre. The boats on the Avon are also a little different. 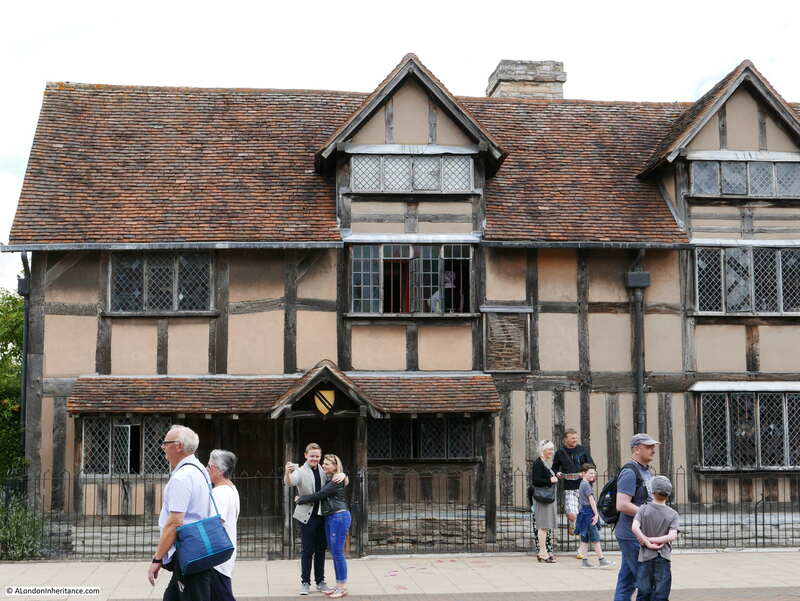 If you are a tourist in Stratford-upon-Avon you head to the birthplace of William Shakespeare. John Shakespeare was a glover, but also traded in wool and corn. He bought the main part of the house which is now the birthplace in 1556. 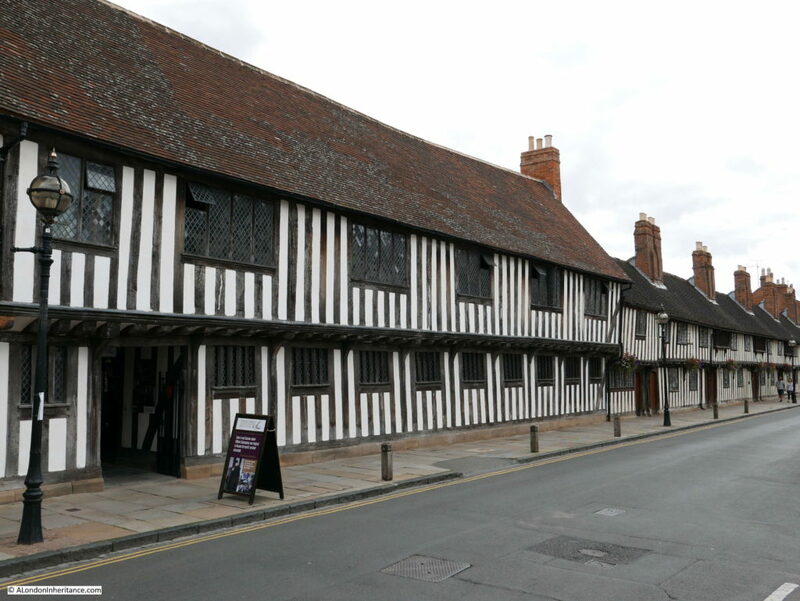 John was married to Mary Arden and their eldest son, William Shakespeare was baptised on the 26th April 1564 (his date of birth is not known but must have been a few days earlier). 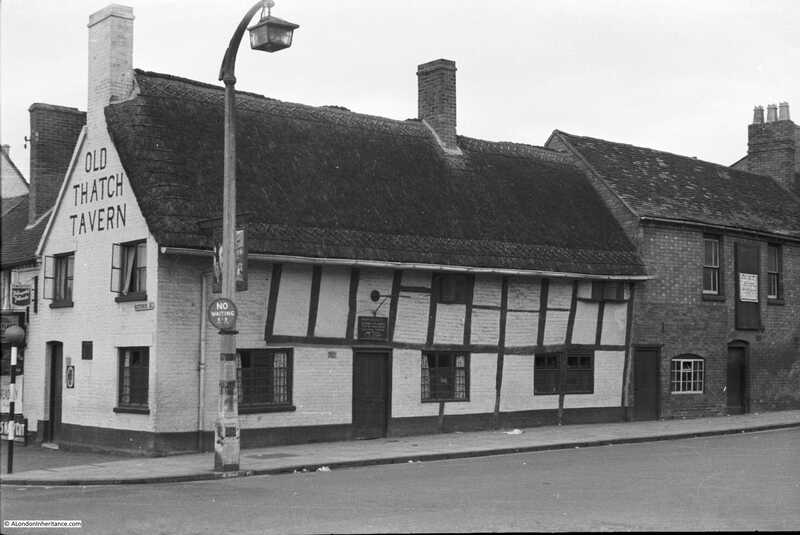 And here it is today, still a pub, with the same name and looking much the same, although the door on Greenhill Street has disappeared along with the plaque above which would have been interesting to read. 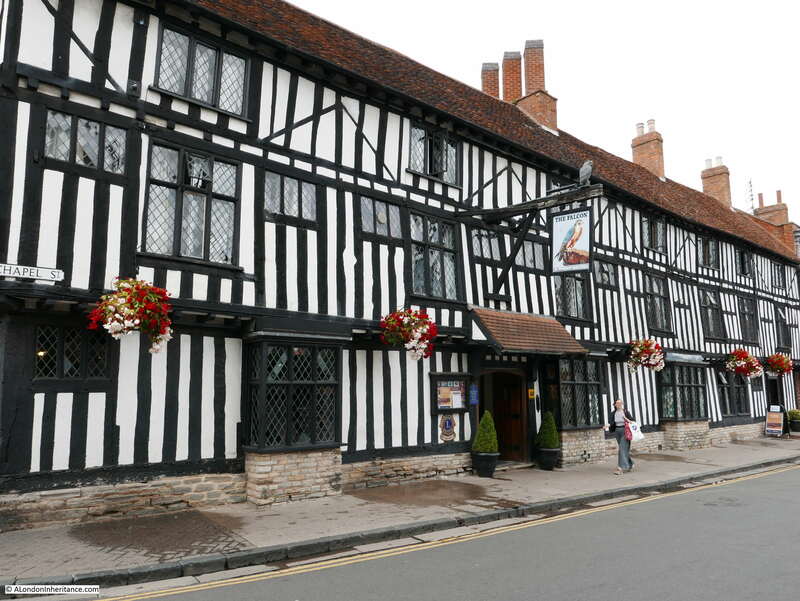 The pub is Grade II listed and dates from 1470. 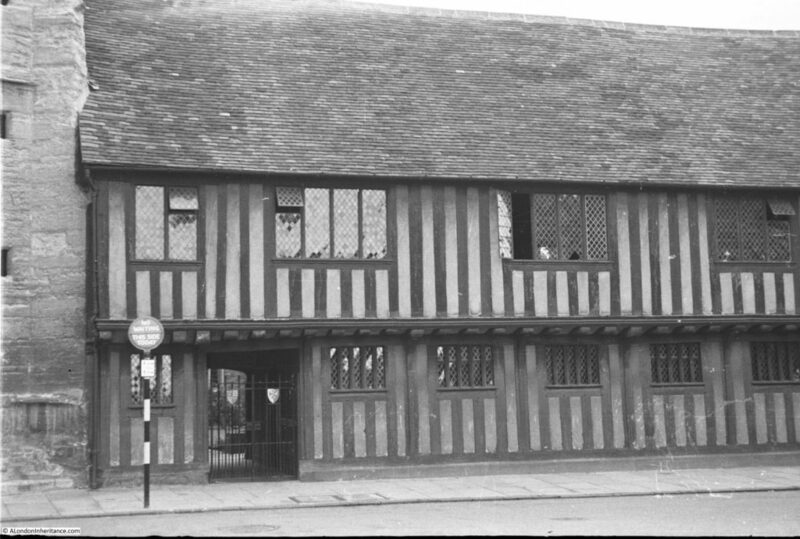 Dating from 1596 when the house was built by Thomas Rogers, the grandfather of John Harvard who was one of the benefactors of Harvard University in the US. John was one of the members of the Massachusetts Bay Colony in the 17th century and on his death left a considerable sum of money and his library of books to the colony’s college which was renamed in his honour. 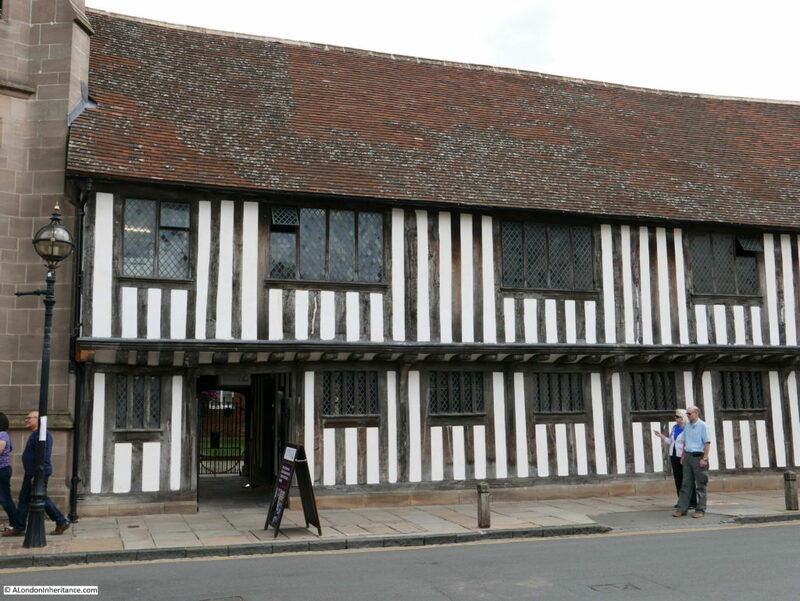 The house is now owned by Harvard University, and is cared for by the Shakespeare’s Birthplace Trust. Note the small stars and stripes symbol on the left of the building in the above photo. That also explains why the American flag is hanging from the building today. 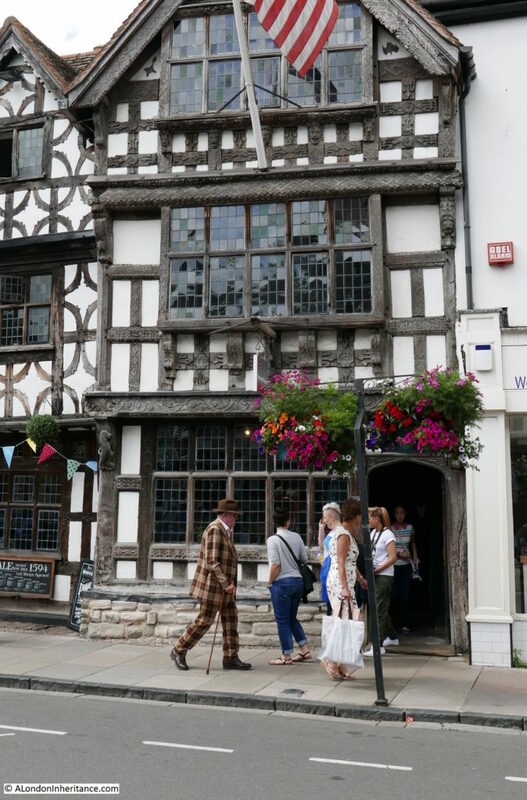 The buildings to the left of the above photos and in the photos below are Shakespeare’s Schoolroom and the Guildhall, where Shakespeare went to school and saw actors performing at the Guildhall. If you look at my father’s photo above, there is a sign at the side of road in front of the entrance. The sign reads “No waiting this side today”. Although the sign has gone, on the wall of the building to the left there is still the following sign. 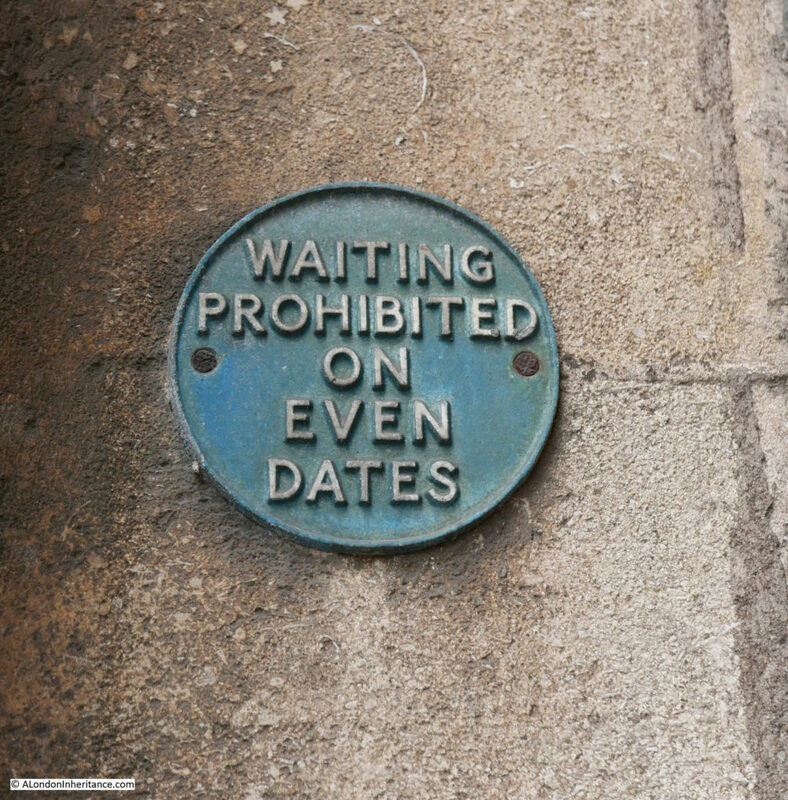 No idea why you could not stop here on even dates, but good to see this sign is still here which is probably associated with the sign on the road in 1949. I started this post with a reference to the English Civil War with the John Hampden monument and the battles at Chalgrove and Edge Hill. 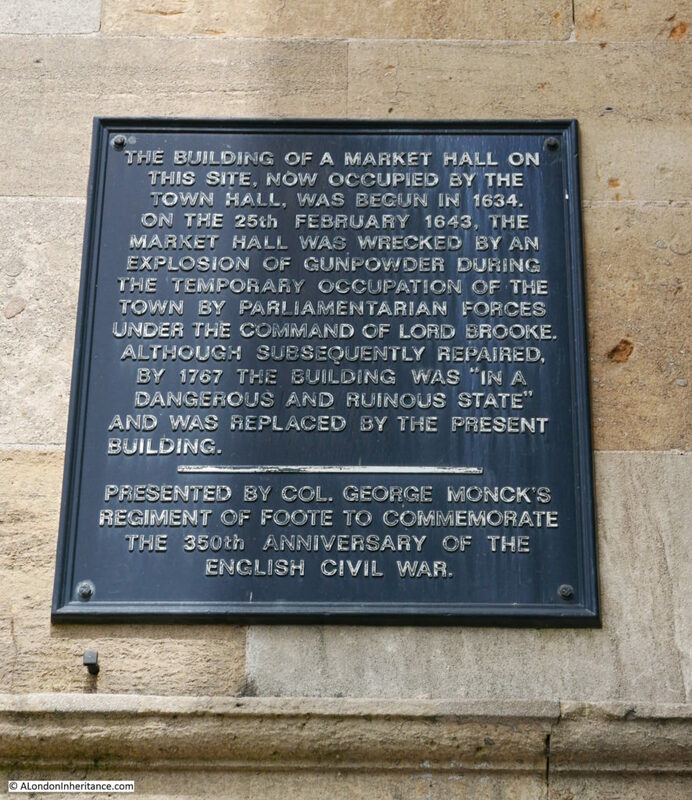 Stratford-upon-Avon also records the impact of the Civil War across this part of the country with this plaque on the side of the Town Hall. 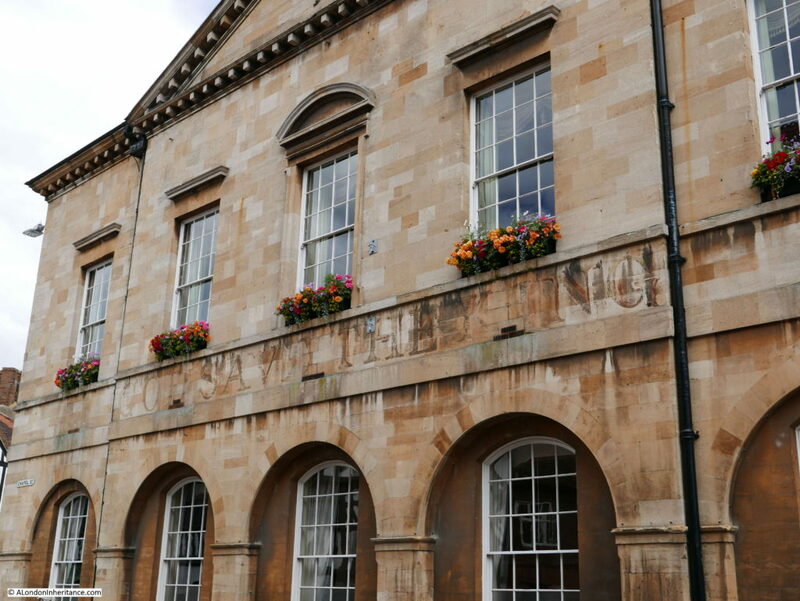 The Town Hall also has a very interesting ghost sign running along the front of the building just below the flower boxes, the outline of the original painted words of “God Save The King”. The King in question was George III who was the monarch at the time the new town hall was built and the sign dates from this time. And here we finish a brief journey from Chalgrove, through Wroxton, along the A422 to drop down over Edge Hill and into Stratford-upon-Avon. While the story of Shakespeare is well-known and with major tourist attractions both in Stratford-upon-Avon and Bankside in London, it was interesting to discover more about the Civil War through the Hampden monument in Charlgrove and Edge Hill – this period in British history does not get that much attention these days. The guide post in Wroxton is also a wonderful reminder of the old roads and tracks that crossed the country. 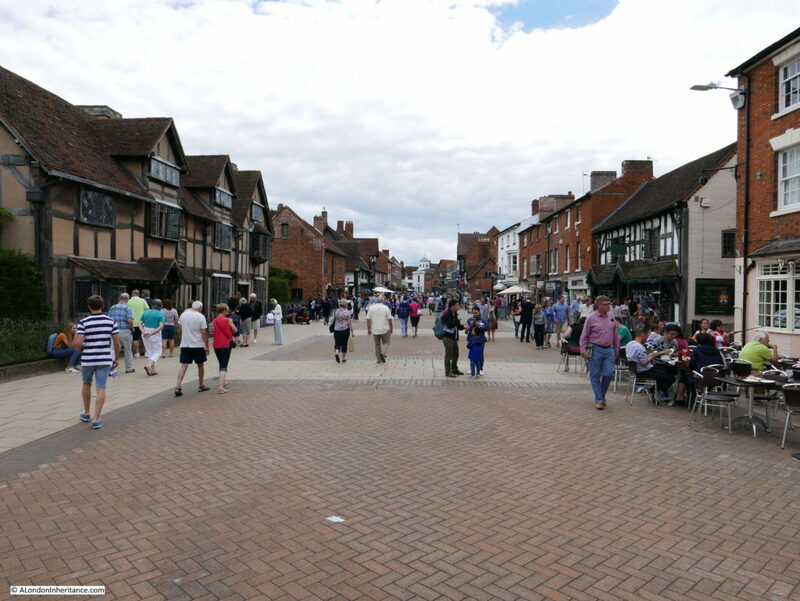 Again, another post that has just scratched the surface, but hopefully has provided an insight into the road leading to, and the town of Stratford-upon-Avon. 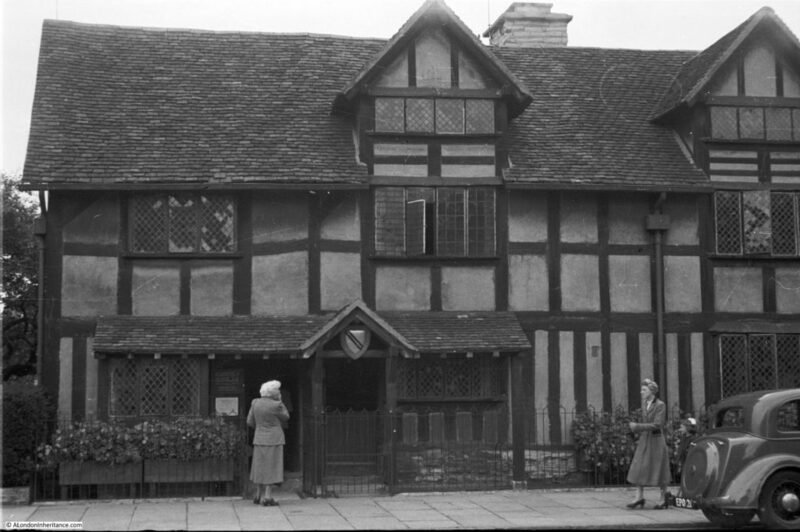 And finally…..on the same strip of negatives as the Stratford-upon-Avon photos are the following two photos which I have been unable to locate. I assume they are in the same area as the architectural style is right, however being on the same strip of negatives does not guarantee this. 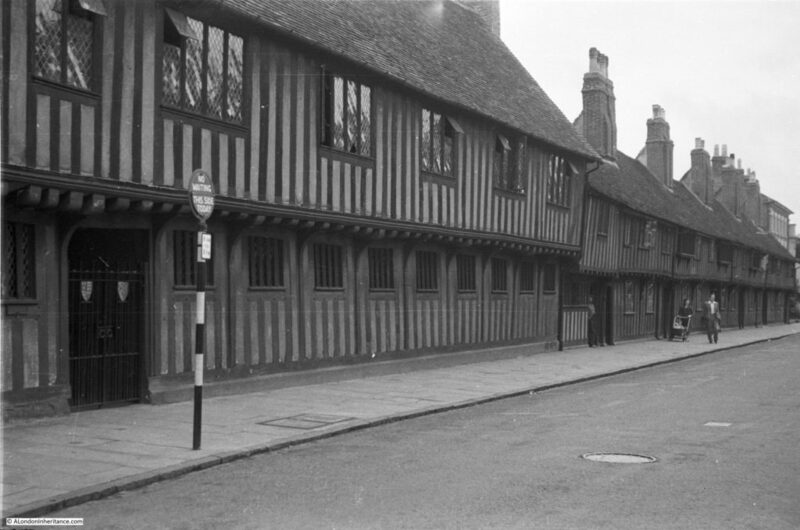 In the window on the right of the entrance door in the photo below, there is still the wartime sign “Air raid precautions volunteers enrol here”. Any information as to the location would be really appreciated. 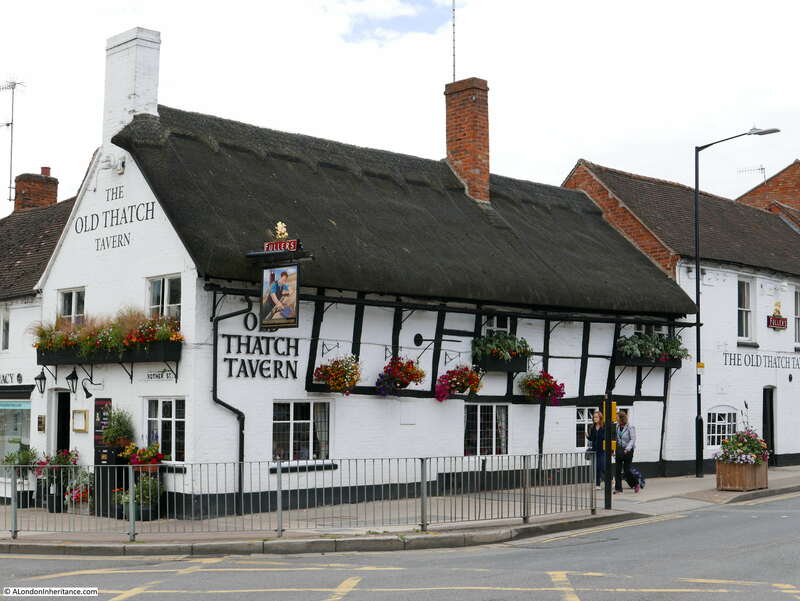 This entry was posted in Cycling Around Britain and tagged Chalgrove, Civil War, Edge Hill, John Hampden, Stratford-upon-Avon, Wroxton on August 21, 2016 by admin.